It seems that everywhere I turn I am bombarded with messages to eat animal products. Between advertisements on television, photos on billboards and songs on the radio…it is endless. (Read more…) Home Depot hands me free coupons for Wendy’s fast food. Even my son’s piano lesson book has songs about ice cream and meatballs. In the midst of this ocean of burger joint jingles, white-mustached celebrities and happy-looking cows, it is a relief to know that there is a beacon of reinforcement in the form of an animated television show: Sitting Ducks. Have you seen it? Although it is not a show about being vegan, Sitting Ducks emphasizes the benefits and challenges of going against the main stream when it comes to diet. The series was created by Michael Bedard and originally ran from 2001 to 2003. 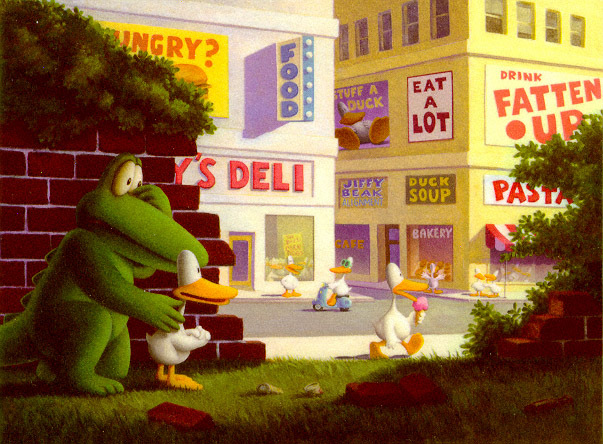 It is about an odd friendship between an alligator named Aldo and a duck named Bill. Aldo lives in Swampwood with the other alligators and Bill lives in Duck town. Normally alligators eat ducks, however, Aldo and Bill have managed to become fast friends amidst the surrounding ducks and alligators who find it hard to believe. This is a cleverly written series that demonstrates how friendship is more important than what the masses think. The show is not about being vegan but deals with most of the issues that vegans do: not fitting in, enduring ridicule from your peers due to dietary choices, being conscious of how your diet affects those you would normally eat, etc. Whether you are an adult or a child, this show will provide you with powerful messages on the importance of standing out from the crowd and that it is okay to eat differently than those with whom you were raised. 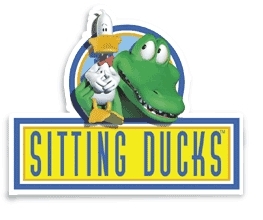 You can watch Sitting Ducks via instant play on Netflix, hulu.com and it is shown on U.S. television channel, Qubo. If you find other programs that are at least conscious of different food lifestyles, please share!